We started the walk around 11:30, I was getting a little worried that we left the start too late. Figured Echo Point Campsite would be a back up. 11.5km 5hrs is what the Take a Walk book tells me. Off along the Border Track to the second Albert River Circuit start/finish, this is the shorter distance to Echo Point Campsite which is the launching pad for Rat A Tat. Stopped at Cominan Lookout and than Echo Point Lookout. We had made pretty good time to Echo Point Camp Ground and Wendy was keen to push on to Rat A Tat. We found the start of the track.......was easy enough to follow for the first bit but faded a bit before heading up to Mt Worendo, had to scout around twice to find the track. From here on it was pretty straight forward following the track. I soon discovered the GPS couldn't punch through the canopy. Compass was no good and map to ground was a challenge given the canopy and the inability to spot features. If Wendy had asked where we were on the map it would have been a calculated guess. I was pleased when I did get location on the GPS that I was only 200m off where I had thought we were.......2km 200m error. Managed to get a could of more locations along the way to keep me in check. I marked a nice campsite along the ridge which I thought would be a good back up if we don't make it to Rat A Tat. 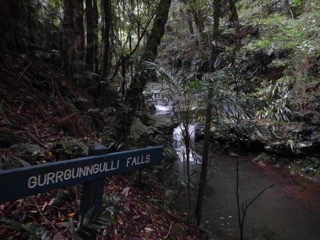 We found the turn off to Rat A Tat just before the assent to Mt Durigan. I was starting to feel the pinch......Wendy powered off in search of the sign on the tree. It's a steepish drop into Rag A Tat........I'm already thinking of the start the next morning. 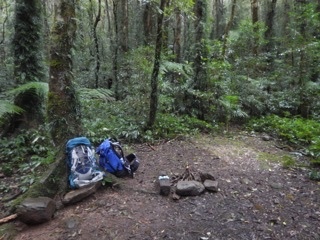 What a cracking campsite.............light was fading fast, we arrived at 4:30, spot on 5hrs. Had a good look around the camp area and a quick walk to the creek. We set up camp, experienced our first de-hydrated meals.........we were impressed with the meals from Strive. 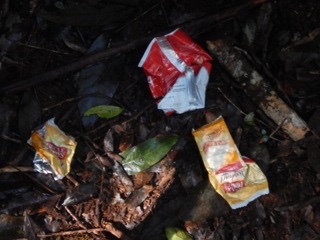 I popped down to the creek to see if there were any glow worms about........to my disappointment I found dumped rubbish form previous camper, geez this pisses me. I ended up slipping down the bank, when I turned my light off I discovered I probably took out a few glow worms, double disappointed after finding rubbish. I was nackered and was keen to lay down......1/2hr later it started to rain, good timing. It rained on and off all night. Woke in the morning to a nice dry tent with no condensation........although I could feel just about every muscle in my body, was not looking forward to the start of the walk out. Breakfast, tent packed we were on our way. We found navigating the return trip quite easy until the decent in to Echo Point Campsite where we lost the trail twice and it took a bit of scouting to get back on track. Wendy was still bouncing along leading the way. At Echo Point Campsite we decided to take the longer route home by completing the Albert a River Circuit. This added approx. 4.5km to the return trip. Four big trees were across the track which took some negotiating. Grrrrrrr after picking up other people rubbish at Rat A Tat I spotted a chip packet off the side of the track.....my legs were weary and was lazy as I didn't want to take my pack off to pick the packet up and walked on feeling a little guilty............only to come across another chip packet and two muesli bars wrappers, I picked them up and secured them in my pocket. I cannot believe how people can just dump drop their rubbish right in the centre of the track. 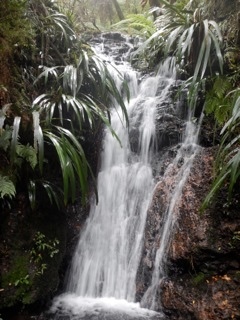 Any way we were glad we made the effort to complete the circuit as we enjoyed the water falls. 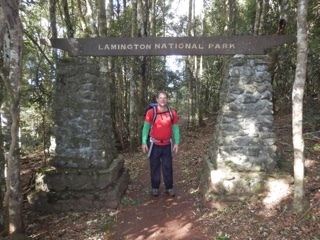 Must say it was a slog for me along the border track back to green mountain, leafs were tired and feet sore. 16km 6hr 45min for the return. All up 27.5 ish km's, we really enjoyed the off track part from Echo to Rat A Tat. We booked camping permits for Echo Point just incase......but camped at Rat A Tat, probably not the right thing to do but there were zero bookings in the system. We didn't summit any of the mountains.........will leave that to next time. My pack was 13kg minus water at the end of the walk. We were happy with almost all of the gear we have purchased to date. Great stuff! Well done. That pack weight isn't too bad for a first overnighter. So frustrating seeing the way people treat the wilderness sometimes. Luckily it is the minority otherwise we'd be up to our armpits in rubbish at popular places like Lamington. You did well to find the turn off to rat-a-tat without too much hassle. 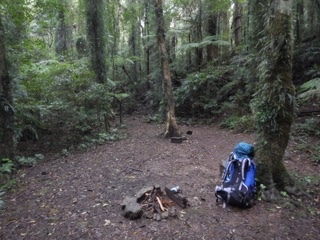 Although its been a while since I was there I had a friend who walked in there and couldn't find the campsite at all. Had to camp on the track on the ridge somewhere. I remember we had trouble too the first time. Track gets a bit vague right before the sign. I would have pushed on a bit if I was solo as I reckon I would have missed it.......well pushed on til the first steep bit than turned around. Oh.....just realized, the fire place was like that when we arrived......Wendy did ask is the wood dry enough, I said no it's too wet. It looked like somebody had a crack at lighting it. Nice post - it's a great place to camp, although there were fewer signs of human occupation when I was there Glad to hear you had a great trip! I am trying to gather a few friends to do this walk from spring and would like to get a copy of your gpx track if possible. There are discrepancies between the track maps online and gps and strava data. I have had a look at the Take a Walk in se Qld and will take it. Nothing usable off the GPS.......plus I don't have the cable to down load.